“Alita Battle Angel” must have a sequel!! Merry Christmas everyone ^_^ Wow it’s been so long I almost forgot my password lol. i think i'm starting to like this new forum. but i'll still miss the old version cos it's cute. thank you everyone for all the hard work. So many upcoming lakorns that looks so good!!! I can't wait. 2017 should be good. I'm looking forward to both ch7 and ch3 lakorns. Omg Trump is in the lead!!! Same here I'm disappointed Trump. I thought Clinton would have got this in the end but sad. Anyway now the Republicans won the President, Senate, and the House. I'm more shock that Republicans got control of the Senate, and the House. Buckle up, it's going to be a bumpy ride. Do we have a thread for Karn La Krang Neung Nai Hua Jai ? I come across that Lakers, anyone know if it airs yet? I couldn't find the episode. Its in the 'Previously Aired' In our Lakorn section because it ended. Thanks Sunny. Havent watch any drama since Nirvana, then this one catch my eye. I miss my Ah Biao. Fifty shade darker trailer look so hot! I can't wait. I'm craving for a good slap-kiss lakorn staring Nadech T_T!! Yey!! 'Finding Dory'. I love Ellen. Finally she's been waiting so long for this. I'm sure Angelbaby has plastic surgery. Why she keep denying it and says she's all natural? gee!! Lol people still don't buy it. Said the doctor can be bribe. Vaness's wife once show her x-Ray picture to prove she's natural too. But I didn't check if she has something done or not. I think Pat Natapa she claimed she didn't have anything done on her face. She said she lost all her baby fat and wear braces lol you can see she went under the knife. Didn't they try to sue a company because they said the company claimed she had PS. I read it somewhere...idk..saying a celebrity never had anything done is like trying to find a needle in a haystack. 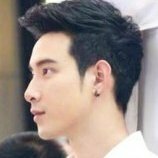 Not really Weir have one Lakorn per year too. I think he has at least 2 a year. 2015 Nadech and Weir both had 2 lakorns. This year Weir & Nadech will possibly have 2 as well at least lol. Despite my busy life, I still have time fangirling lol. Dots is driving me crazy!!! !